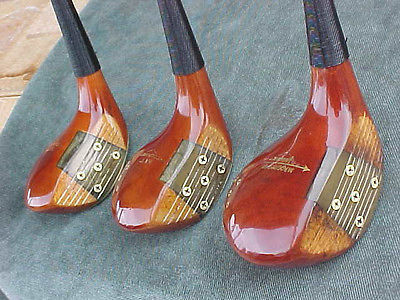 Most recognizable trait of the Persimmon golf clubs is their use of actual, natural wood for their golf clubs. Other more mainstream manufacturers are using metals. Over the years pretty much everyone has moved over to metal, expect Persimmon. Only the club heads, the parts that hit the ball, are made out of wood. Let me just make that clear for those who are unaware of golf club design. Confusingly, these are known as woods. You can also have iron woods, they are called just irons. That’s beside the point though. Image above shows a classic Persimmon golf club design. I’m not entirely sure of this, but I believe that they are each handcrafted by experts, for maximum quality and performance. Shafts can be either graphite or steel. Sadly all these features make the Persimmon golf clubs a bit more pricier. Between £320-£345 depending on the they of club and the type of shaft. Modern ones I don’t have, but I do have a couple left over from my dad, with which we used to play. That’s what makes them very special and close to my heart. Definitely worth checking out.